Jesus tell us in the Bible,(Matthew 19:26) , "With man this is impossible, but with God all things are possible." It requires faith to hold the tears back when everyone has told you to simply give up and cut your hair or your precious child’s hair. It requires faith to stand tall when every salon or even your favorite hairstylist has rejected, judged you and looked down upon you because your hair is so tangled and matted. And now you are depressed. It requires faith to look in the mirror at your hair that is in clumps stuck to your scalp and say I will get my hair back! It requires faith to not give up and keep searching for help. I had a sewin for 6 months. I removed my sewin. Since it had been a long time since my hair had been thoroughly clean (without the sew in) I decided to wash my hair. After shampooing and conditioning my hair my hair was badly matted. I did not know what to do to fix this problem. Not only had I ever experience this, I also never really known anyone else to experience this. I knew that if I went to a beautician they would have quickly cut all my hair. I went on the internet to different sites. I discover that I was not the first to have gone through this experience. The remedies I found included saturating my hair with water and conditioner and slowly untangle the hair. The first day I saturated my hair with water and conditioner and I tried untangling it. I did this for the next three days. I was successful at untangling some of the hair but as the days went on I discovered large bundles of hair all tangled up in knotts. 4 days had gone by with me spending hours with my hair and I had made no progress with the tangled hair. I know it is just hair but if I could do anything to keep it I felt that it did not hurt to give it a shot. My hair was not just matted. Again it was matted and I believe the more I saturated it with water and conditioner the worse it got. It was literally knotted (huge bunch of hair all tangled up in a large hard hump of hair) in different sections of my head. I mean really knotted (like rat knotts) the knotts were so big that I thought it would be impossible to repair. My sister was convinced that it would have to be all cut. I did not give up. Through my research I saw a clip on YouTube with some girls giving a seminar on how to take down dreadlock and other matted hair with the TakeDown product. I still did not think this would work for me because again my hair was now in big hard knotts. I was at a little more ease knowing that someone has gone through this dilemma before me. I finally sent a message to TakeDown and ask if it was worth the effort to save my hair or realistically was my hair the worse case. TakeDown representatives responded and highlighted do not cut your hair. They gave me hope although I rarely believe anything from the internet but it did not hurt to try to save my hair. It already takes a long time for my hair to grow back so I just did not want to give up. A tangled hair tech told me to buy the TakeDown product and give her a call and she would walk me through the process. I did not know how she could walk me through the process with these big huge knots I had in my hair. I ask if she knew anyone that could physically untangle this matted hair from my head. I met up with this young lady with very little hope. I really thought that I was being had or being given false pretense. 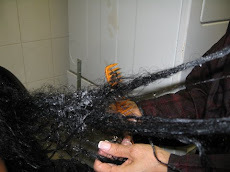 With patience (approximately 4.5 hours) she untangled the matted and knotted hair. I could not believe it, but with the TakeDown product detangler products and more importantly with her expertise she untangled my hair. I would like to say thank you so much for your help! used your product along with alcohol and it worked! Yes, it worked! cut it but I didn't.